Apprising Ministries is among those online apologetics and discernment ministries (OADM) who have covered Louie Giglio, Passion 2013, And Jesus Culture; Passion 2013 concluded this weekend. In Friends Of Bethel Church, Home Of Jesus Culture I brought out that this Giglio conference filled the Georgia Dome with some 60,000+ college aged youth, but there may be an agenda to be wary of. Youth have been raving about how this conference changed their lives, which is the point. 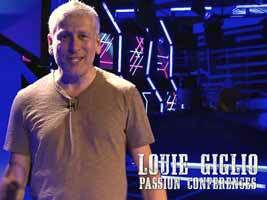 That being, what it appears Louie Giglio has done/is doing with his 268 Generation aka the Passion Movement. In addition, that BC pastor Bill Johnson surrounds himself, and the BC ministry JC, with a wild assortment of spiritual wingnuts like NAR “Apostle” Lou Engle and “respected prophet” Cindy Jacobs. Did you catch that; JC mommy Jacobs speaks into the Jesus Culture Movement. What it’s beginning to look like is that Giglio may have made a conscious decision to align his own youth movement with JC’s. So, it’s against this backdrop that we now will look a little further into what these 60.000 young people were being taught at Passion 2013, which they are telling us has made such a change in their lives.